Once the stuff of futuristic stories, delivery drones are fast becoming a reality. According to estimates from the Federal Aviation Administration, as many as 3 million commercial drones could be flying in U.S. airspace by 2020. The prospect of having a package arrive at your door within a matter of minutes is undeniably exciting. But are we ready for the hidden costs, the safety concerns, and the trade-offs for this convenience? New RAND Corporation research is mapping the questions that consumers and policymakers alike will need to explore before widespread adoption of this promising new technology. It’s Sunday night, dinner’s on the stove, and your fifth-grader suddenly remembers that she needs a costume for the Arbor Day play tomorrow morning at school. If companies like Amazon, Google, UPS, and Alibaba have their way, drones will soon play an increasingly significant role in the "last-mile" delivery — from warehouse to doorstep — of small, light packages that a customer needs now. 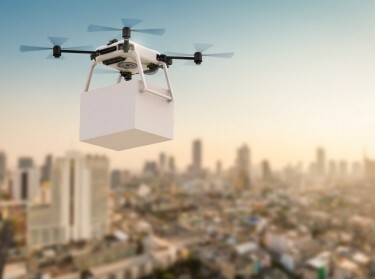 Given that almost 80 percent of what consumers order online weighs 5 lb or less, delivery drones could have important implications for energy consumption, public safety, privacy, air and noise pollution, and air traffic management. To gain a better picture of how commercial delivery drones might affect daily life, RAND put together a multi­disciplinary team of experts to scope this new research area. 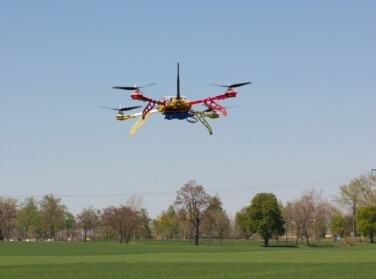 Most of the details about drone designs and business plans are still proprietary, so the team marshalled its collective expertise — in advanced technologies, unmanned aerial vehicle operations, transportation research, systems analysis, modeling and simulation, and behavioral science — to study the different facets of drone delivery systems. The team explored the hidden or indirect costs and the potential consequences, both positive and negative (what economists call externalities), of adopting commercial delivery drones. By helping regulators and policymakers understand the magnitude of the issues surrounding delivery drones, and by pinpointing areas where there will be a need for analysis, findings from this exploratory study can help shape a research agenda that balances innovation against the safety and well-being of the public. So, what are the policy issues that your fifth-­grader’s tree costume might encounter on its way to your doorstep? If companies have their way, drones will soon play an increasingly significant role in "last-mile" delivery. A drone’s point of departure will affect energy consumption, fleet size, aerial congestion, noise, and privacy. Using mathe­matical models, the research team explored the effects of delivery drones in four hypothetical city settings — again, without access to either proprietary aircraft designs or business models. 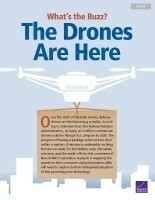 What they found was that both the number and location of delivery drone centers matter. 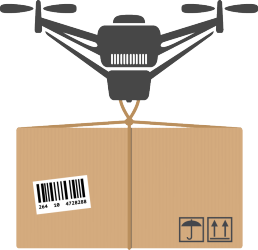 An increase in the percentage of parcels delivered by drones (versus by trucks) could increase the energy consumed per parcel — by up to an order of magnitude in some cases. 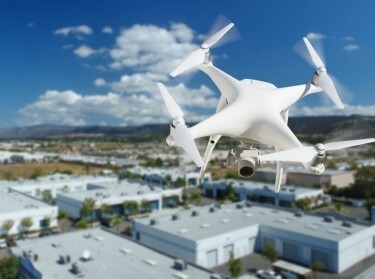 In a large city, a drone might have to fly a long distance from a distribution center to deliver a single parcel, unlike a truck, which can drive the same distance with multiple parcels. More drone centers would mean shorter flights, which, in turn, would mean lower energy consumption per drone. More drone centers would cut drone fleet sizes as well, because shorter flights would allow for more deliveries per drone. Fewer drones in the air, and shorter trips, could also reduce aerial congestion, privacy, and noise. But there will be some trade-offs to having more drone centers. 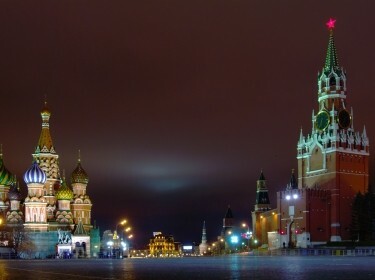 For example, neighborhoods may oppose the construction and presence of the centers. And people living near a drone center would experience more activity overhead than those living farther away (much like with airports). A sky full — or even partially full — of drones raises questions about privacy, noise, and safety. If all the small parcels in Los Angeles were delivered by drone, one-eighth of the city would be within camera range at any given time. Commercial delivery drones will need cameras and data collection sensors to help them navigate. A byproduct of this will be a new level of surveillance as people go about their daily business. For example, if all the small parcels in Los Angeles were delivered by drone, one-eighth of the city would be within camera range at any given time. Just how this surveillance will affect privacy depends on questions such as who owns the data; how that information will be used; and whether people behave differently, for good or ill, under the gaze of drone cameras. Noise from aircraft can have a range of effects, from disturbing human sleep and hearing to disrupting wildlife and reducing property values. Drone noise will depend a lot on drone design, but simplified models in the study suggest that, once a drone is at its travelling height (about 100 meters), even one as loud as a lawn mower will be barely audible to people on the ground. As drone traffic increases, so will overhead noise, but not by as much as might be expected. Nonetheless, noise from sustained hover, landing, and takeoffs in neighbor­hoods could be a problem. Possible solutions include altering a drone’s flying height — relatively small changes in height can have a larger effect than reducing the number of drones generating the noise — and designing quieter drones. An increase in drone traffic will also mean an increase in the risk of drones striking one another, colliding with other aircraft, or crashing to the ground. But current Federal Aviation Administration regulations don’t cover airworthiness standards for drones or the management of drone traffic. An updated, or “drone-centric,” version of the Air Commerce Act of 1926, which mandated that the government establish navigational aids and safety regulations for pilots, could help promote safe drone activity. The convenience of your daughter’s costume arriving before bed aside, just how much energy did this drone delivery require? Using real data for Minneapolis, and assuming that 80 percent of delivery stops are for packages weighing 5 lb or less, a simulation model found that drones (versus trucks) could save almost 6 percent of the energy needed to deliver packages within a 10-mile radius of the city center. While noise abatement efforts and airspace restrictions might reduce this efficiency, advances in battery technology and drone design could make up for those reductions. Also, depending on the sourcing of the electric power that drones use, drone deliveries could have a much lower carbon footprint, and produce less local air pollution, than traditional delivery trucks. A 10–15-mile delivery radius is likely sufficient to cover most U.S. urban areas. A delivery drone with vertical takeoff and landing capabilities can ease operations at the terminal area, though at a cost to cruise efficiency. The limited delivery range and payload requirements, coupled with the power efficiency of electric motors at small scales, makes vertical takeoff and landing viable. Currently, leading commercial designs for delivery drones represent the limit of what is possible when assuming a simple, moderately efficient hybrid multicopter configuration and today’s battery energy density. For this class of drones, the research team estimates the energy required to deliver a 5-lb payload out to a radius of 10 miles to be about 1.5 kWh. Improving flight efficiency — through aerodynamic refinements and improved batteries—could support more-efficient multistop delivery drones. How Are Other Countries Regulating Delivery Drones? Regulators around the world are struggling to keep pace with new drone delivery technology. 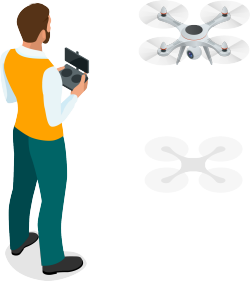 Drawing on a literature review and expert discussions, the research team summarized commercial drone regulations worldwide, almost all of which were written or amended within the past two years. Some countries are outright banning the use of commercial drones, some are almost entirely permissive about the use of these drones, and some are waiting to observe the effects of other policies before acting. Current regulations typically cover pilots’ licenses, registration, restricted zones, and insurance. Regulations vary based on such parameters as drone mass, population density, altitude, and purpose. The primary obstacle to using delivery drones in most nations is a requirement that drones stay within the pilot’s line of sight. In the face of much uncertainty, RAND’s preliminary study has identified and begun to answer pressing questions that policymakers, regulators, and the public will need to address going forward. The goal is to shape policies that can help realize the benefits of drones while minimizing adverse effects — all without stifling innovation. This project is a RAND Venture. Funding was provided by gifts from RAND supporters and income from operations. The research was conducted by RAND Justice, Infrastructure, and Environment. Lohn, Andrew J., Timothy R. Gulden, Jia Xu, Therese Jones, Kenneth Kuhn, and William Welser IV, What's the Buzz? The Drones Are Here. Santa Monica, CA: RAND Corporation, 2018. https://www.rand.org/pubs/research_briefs/RB9995.html.